At Kale & Cocoa our aim is to eat well and age well. So far, so good. But we know that eating well is only half the battle when it comes to ageing well. Exercise is absolutely key too – an article published by John Hopkins University in the U.S. described it as ‘the universal antidote to ageing’. A long term study of over 19,000 people in Texas showed that those who exercised regularly through their middle years and beyond were 40% less likely to develop dementia. Exercise lowers our risk of breast, colon and possibly prostate cancer. It can prevent – and treat – Type 2 Diabetes and reduces our risk of death from heart disease. An antidote indeed. We know good nutrition is critical to exercising well – Sher swears by a banana as a pre-run snack – and, luckily, many of the foods that help us age well are great run fuel too. According to Runners’ World magazine the 15 best foods for runners are: almonds, eggs, sweet potatoes, wholegrain pseudo-cereals like quinoa, oranges, black beans, salad greens, salmon, wholewheat bread and pasta, vegetables, chicken, berries, dark chocolate and low fat yoghurt. There are loads of recipes on the blog that fit the bill: our almond dipping sauce is great with salads, grilled chicken or salmon (and would work well with the sweet potato cakes below); our black bean chilli is the best ever (we think, anyway!) there are loads of wholegrain-based salads and our dark chocolate ‘brainies’ are fantastic. But Sher asked us to create something exclusive for Old Girl Running as she prepares for her next race. 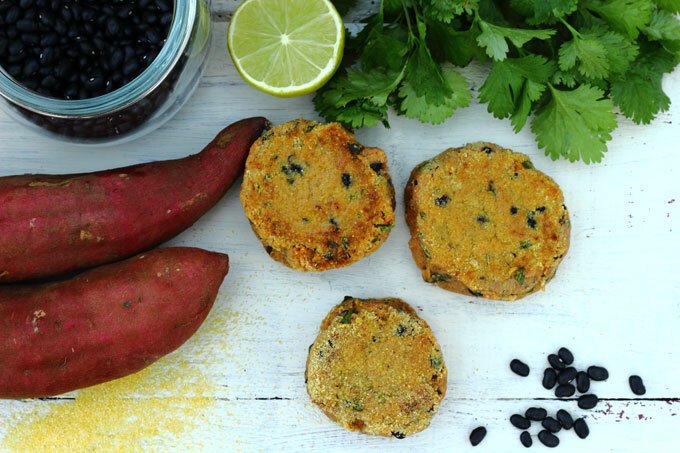 So, taking a cue from the list above, we give you: Mexican-inspired Sweet Potato Cakes. The recipe went up on her blog last week, and now we can share it with you. The great thing about these cakes is that the mixture can be prepped ahead of time and then left in the fridge to firm up. So you can get them ready, head out for a run for an hour or two, then come back to a delicious meal that’s ready to cook. We serve them for a weekend brunch with wilted spinach and an egg on` top, or salad and our almond dipping sauce. Steam the sweet potato cubes for approx. 20mins until completely soft. Mash with the black beans, then stir in all the other ingredients, except the coconut oil. Leave to chill in the fridge for at least half an hour. Go and run! When you are ready to eat, heat the oven to 180C. Sprinkle extra polenta on a large plate. With damp hands, form the sweet potato mix into 8 cakes, then roll each one in polenta, turning several times to make sure they are properly coated. Melt coconut oil in a large frying pan, and cook the cakes for a few minutes each side until brown and crusty. Carefully transfer the cakes to a baking tray and cook until heated through – 10-15mins. While they are heating through, prepare your eggs/spinach or salad/almond dipping sauce. Enjoy! And see you at Park Run!